with JOCL. On my hardware Intel HD4600 CL-GL-interop does not seem to work. I am currently trying to read-back the buffer/image and define the texture from it. Do you have a compilable, small, self-contained piece of code that we could use for a test? It doesn't look like we have a test of OpenGL textures written by OpenCL, so I'd be keen to add it to our suite if you've got something we can debug. We do have a test of a shared GL_VERTEX_ARRAY at https://github.com/JogAmp/jocl/blob/master/test/com/jogamp/opencl/gl/CLGLTest.java which might be helpful to you, but it doesn't write the buffer from OpenCL, it just verifies that the contents match the OpenGL contents. Thanks! 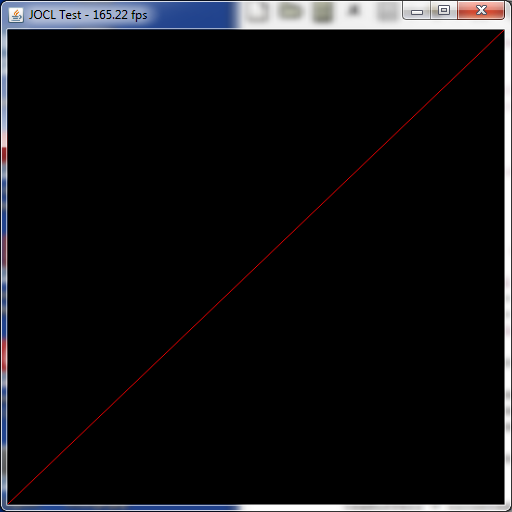 I can upload my small test program for copying an CL image to an GL RGBA texture. for rendering the textured quad!!! I left out the direct.order call on the ByteBuffer. I am not sure, if there is a util function for this task! Still, I could not make the GL texture object sharing work. When you have a single, self-contained .java file you can upload, just put it here and I'll give it a try. GL_INTEROP=true, CL-GL interop gives an exception using my Intel HD4600 device. The window contents are chopped up bits of a recent web search I did, so I assume it's showing uninitialized GPU memory contents. Is this what you expect to see? Hmh, the array notation compiles on the Intel without complaint. But no sizzling. Could you try GL_INTEROP==false in comparison? Yes, GL_INTEROP = false works correctly for me. GL_INTEROP = true looks like we're just looking at uninitialized graphics memory, which implies the OpenCL code isn't writing to it. I'll look closer to see if there's anything obviously wrong. But I don't get any exception, it seems to run fine. I looked into this for a couple of hours today, and there's nothing obviously wrong. All the OpenCL calls are returning the right codes, everything seems to be in the right order, but modifying the CLGLTexture2d just doesn't modify the GL texture, which is left uninitialized. Tomorrow I'll dig into your exception a bit, maybe the Intel driver returns an error that the Nvidia driver doesn't catch, which could help make sense of this. The error code "201779856" doesn't appear in any OpenCL docs that I can find (not in hex either), so I'm not quite sure what to make of it yet. Tried on Mac OS X 10.9.2, got a black window for both Nvidia OpenCL and the Intel CPU OpenCL, both with GL-CL interop on and off. It does show a warning about a pre-existing GL error code 0x502 (GL_INVALID_OPERATION), so I'm going to try checking errors on all GL calls to see if something is slipping through the cracks. so GL errors should be reported immediately after they occur, shouldn't they? I updated my NVidia driver to version 335.23 of 3/10/2014. The test isn't perfect, though -- notice the commented asserts will fail, because the OpenCL call to determine the size of the CL image returns 0 for some reason. I tried a bunch of other stuff too, like making sure the GL texture was "complete", but haven't hit on the right thing yet. I'll keep trying more stuff to try to figure this out. It may be time to write a C test to make sure that this even works on Nvidia cards at all. Still working on this, just haven't had a chance to get to it the last couple of days. Next I'm going to try querying the OpenCL texture object to see if its properties are correct, then I'll try writing the same program in C to see if that behaves any different. Retried this on OS X last night, and figured out how to make it work properly. I had to change the texture2D() call in the fragment shader to texture(), since texture2D has been deprecated (this gets rid of the GL error x502 I had been seeing). Now I get the correct output on Mac for both the Nvidia GeForce 320M OpenCL device and the Intel OpenCL device. I'll try this on a PC tonight after work and see if that makes any difference there. great! You are right, GLSL version 150 requires "texture" instead of "texture2D". But the problem initially and still is "createFromGLTexture2D". "texture : .. Only GL texture objects with an internal format that maps to appropriate image channel order and data type specified in the table of supported Image Channel Order Values and the table of supported Image Channel Data Types at cl_image_format may be used to create a 2D image object. " Perhaps should try some different format than GL_RGBA, GL_UNSIGNED_BYTE with GL! It is strange that Intel and NVidia platform show the same unknown error code! If your device doesn't support, that would explain the error :) I'll try with the Intel drivers on my PC and see what result that gives. But on the good side, we know the code works on at least two devices, so there can't be anything too wrong with it. OK, now the story gets more interesting :) I installed the Intel OpenCL driver on my PC, set the demo to pick the Intel OpenCL device, and ran it. It crashes the JVM when the OpenCL kernel is invoked. But that actually makes sense -- the GL context is from my Nvidia card, and the CL context is from my CPU, and the two don't physically share any memory chips, so I'm handing the Intel OpenCL driver an unreachable pointer to GPU memory, which causes a crash on write. So wait, then how did the Intel OpenCL driver work on my Mac? It's got Nvidia graphics too, not Intel integrated graphics. Aha, but the Nvidia GeForce 320M on the MacBook Air is a low-end card that doesn't have dedicated video memory, it shares memory with the CPU. So Intel CL-GL sharing works fine, because it's all the same memory. And it turns out Nvidia GL-CL sharing wasn't working on the Mac after all, it's just that the Mac will give you a pointer to the same video memory across multiple runs. Since I wasn't initializing the texture to anything, the Nvidia runs would get the texture from when I ran on the CPU, which was still correct-looking. Initializing the texture shows that the GPU isn't successfully writing it from OpenCL. So, next steps are still to try this in C++, and to try this on an AMD card (I've got one lying around, it's just a pain to install in my machine since I have to manually remove the drivers afterwards). Is there a programmatic way of forcing the use of a particular GPU? I thought NV GPU affinity API would help. I'm halfway done writing a Qt-based C++ OpenGL/OpenCL texture interoperability test to see if this feature works at all. I've got OpenCL interop contexts creating, I just need to put a texture on my object and try writing to it from OpenCL. 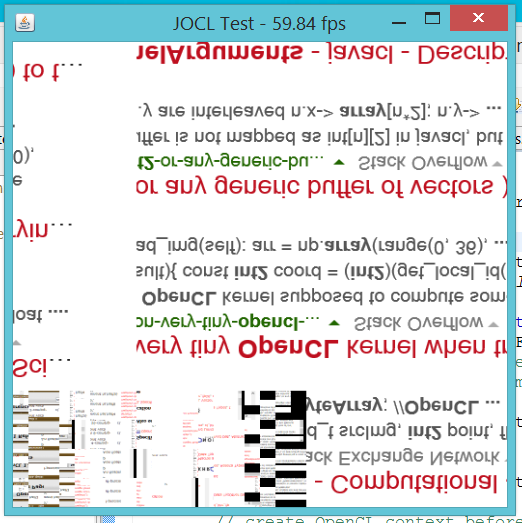 If it works, then I'll have a reference to debug the JOCL against, and if not, then we'll know that it just doesn't work on Nvidia systems yet.